We are very excited to announce that we have a number of Guest Tutors visiting Littleheath Barn Studio this year. Please see below for details.If you would like to book a place please be in touch- workshops get fully booked very quickly. 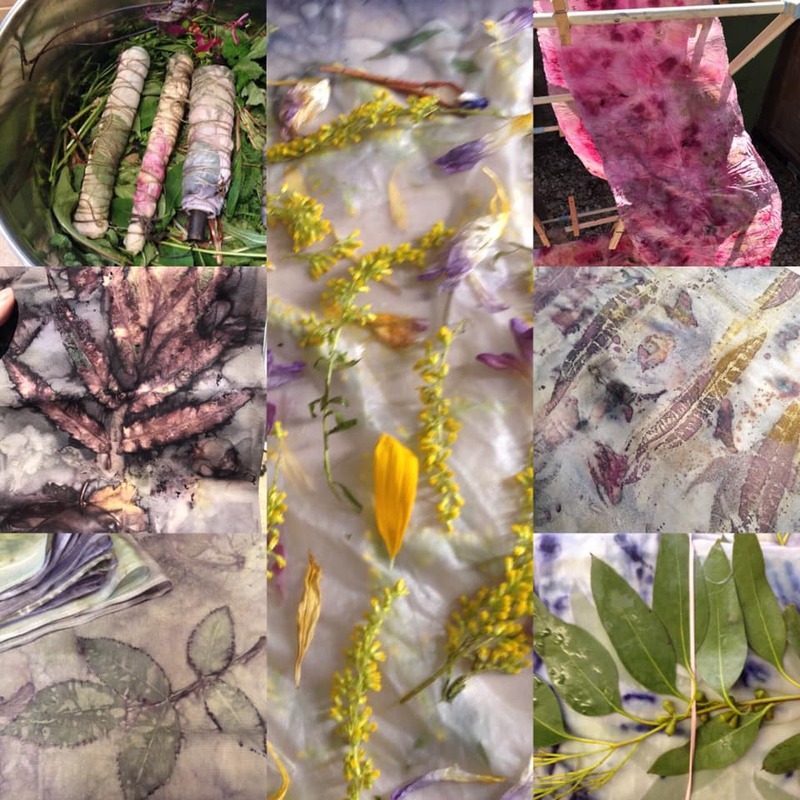 Details: We are excited to be welcoming Claire Cawte Textiles to the studio next spring for this 3-day course in eco-dyeing and botanical prints. Claire Cawte is a welsh textile designer/maker with a BA hons in contemporary textile practice. She is focused on using honest, natural materials sourced in Wales and the British countryside. •happa-zome, a quick and satisfying experience of creating pattern and print . £220 including lunch and refreshments. You will be required to bring your own fabrics. Details: Details: This workshop is another exciting collaboration with Jenniffer Taylor from the Great British Sewing Bee! Jenni will work with you to make a pair of made-to-measure, no pattern, wrap trousers, as featured in her best selling book, Girl with a Sewing Machine. There is an extra twist... you can make them in white cotton and indigo dye them yourself at the end of the day. 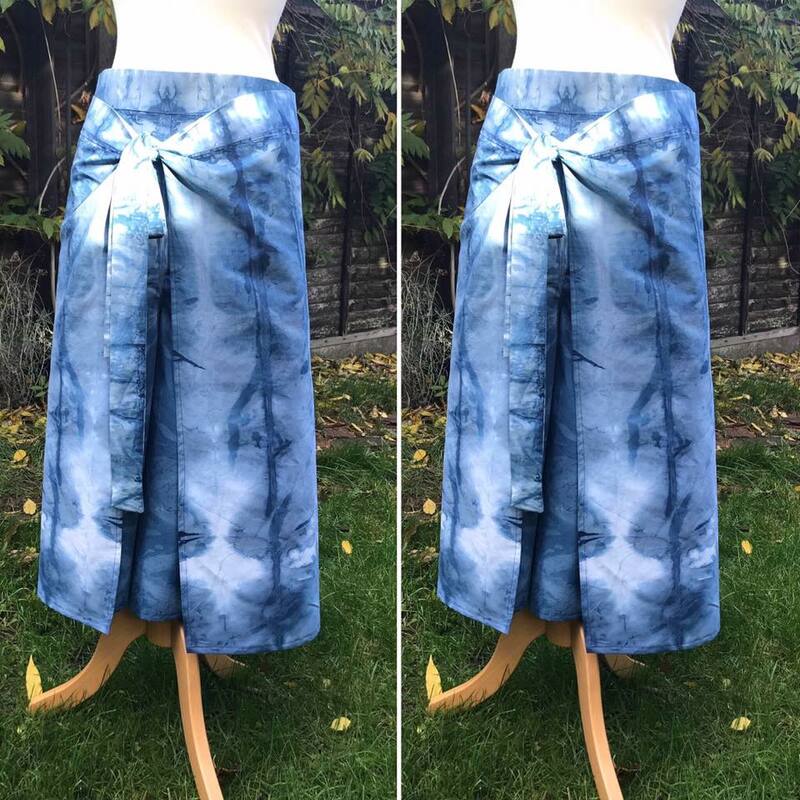 £60 including all materials, if you don’t wish to indigo dye your wrap trousers then please bring along fabric of your choice. Details: This is a fun 2-day workshop in which you will develop your sketchbook pages in a supportive and beautiful environment. On the first day we will work with inks, pens, pencils and collage to develop 10-15 pages with mark making and layering techniques. 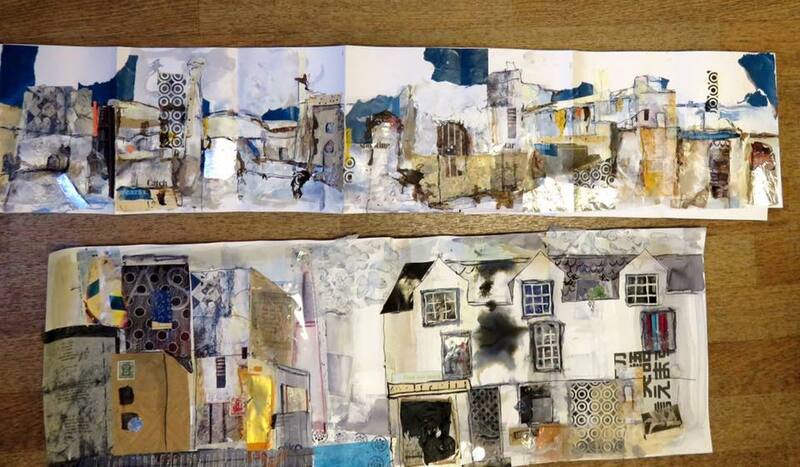 On day two we will sketch around the studio and immediate countryside (weather permitting) responding to the graphic elements and scenery, as in Karen’s sketchbooks. £170 for the course, includes lunches and refreshments. Details: Inspired by Jennifer’s own work you will use recycled papers, stitch and card to create a beautiful bespoke bird box, complete with its own bird on the perch. 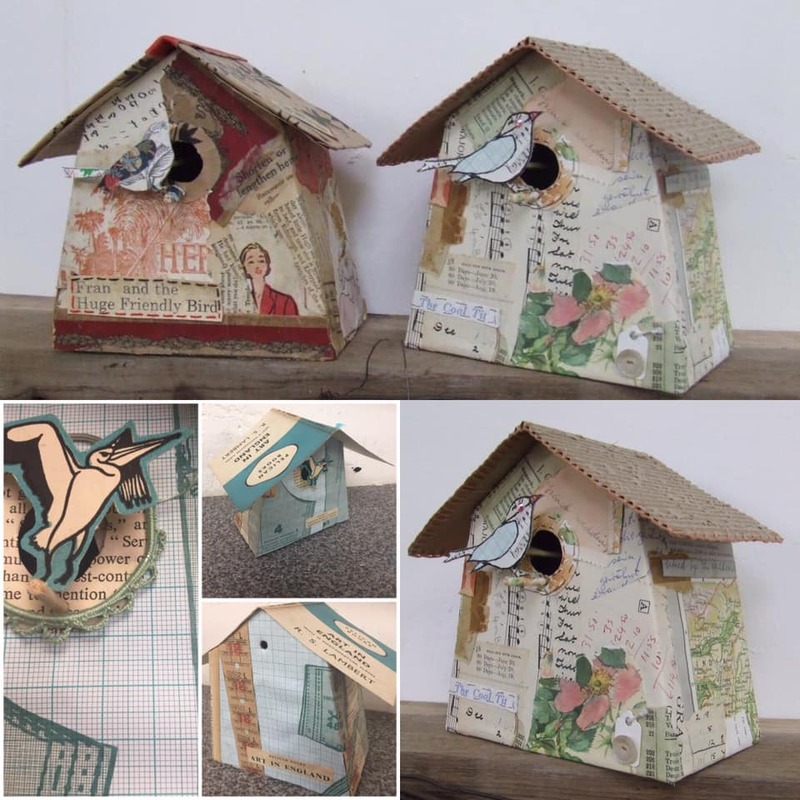 In this workshop Jennifer will guide you through every step of the process, from constructing your bird box, to using beautiful vintage papers to decorate it. This will be embellished with a range of hand stitches, including an optional picot stitch around the door. You will also be shown other techniques such as embossing, and you will go on to monoprint your own bird to sit on the perch. £65 including all materials and lunch. You may want to bring along your own papers, maps, books to personalise your bird box. Fabric preparation with mordants in order to develop the richest colour, an essential foundation. Botanical print direct leaf contact transferring colour from leaf to cloth. £160 including lunch and refreshments.You will be required to bring your own fabrics. 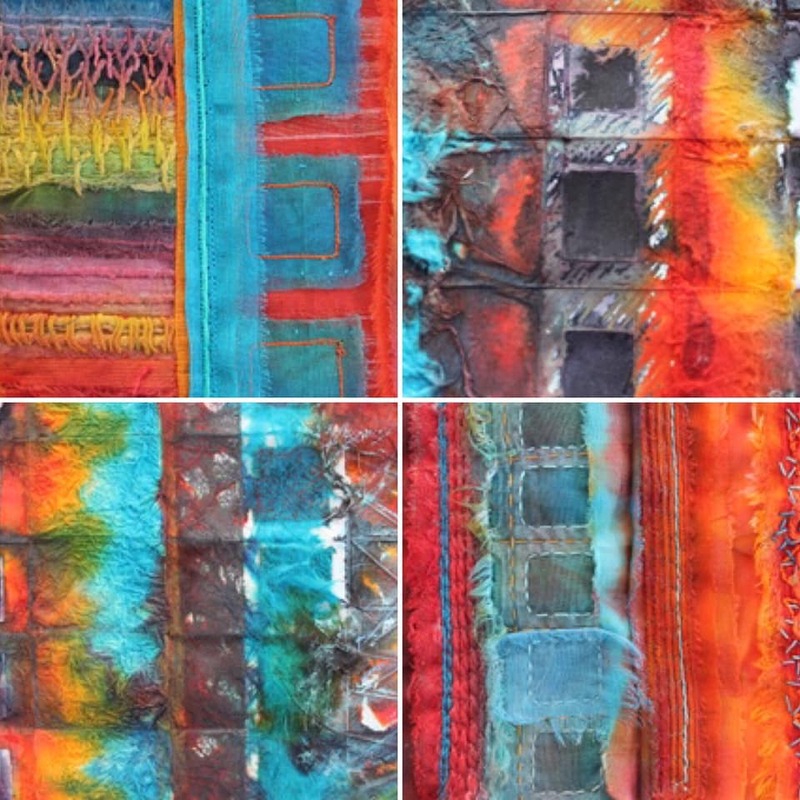 Details: We are excited to be welcoming Ruth Issett, a highly experienced textile artist, to the studio for a one-day workshop exploring ‘Glorious Colour’ on fabric, paper and with some stitch. Immerse yourself in colour and take an indulgent wallow in vibrant and intense colour using layering and stitch. Using coloured papers and then fabrics create a variety of coloured nuggets using various compositional techniques and ideas. These samples will then be further enhanced with the application of some simple stitched colour (participants can work by hand or machine). 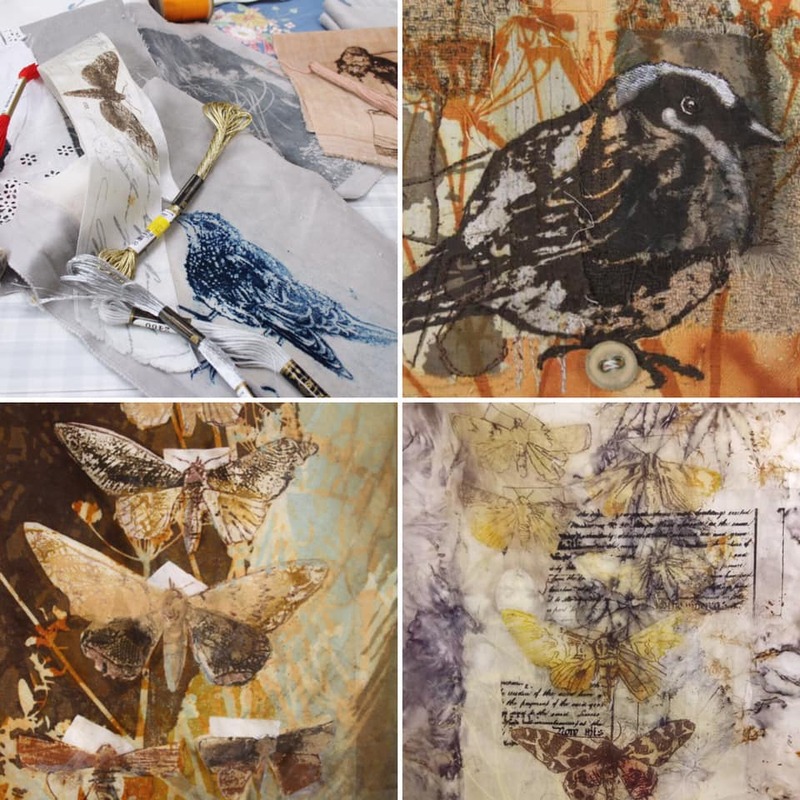 Details: We are thrilled to be welcoming Artist & Printmaker Sue Brown to the studio this year for a one-day workshop exploring Gum Arabic Transfer Printing on fabric. Using a black and white photocopy, transfer indelible images of photographic imagery, drawings or text onto a variety of textile surfaces. This technique retains the softness of your chosen fabric. Create a stash of textile prints to embellish and develop at a later date. Suitable for beginners and artists wanting to develop their practice. £75 including refreshments, lunch and most materials, just bring along a selection of textiles to experiment on.